If you're traveling to Japan, you'll more than likely end up in Tokyo. 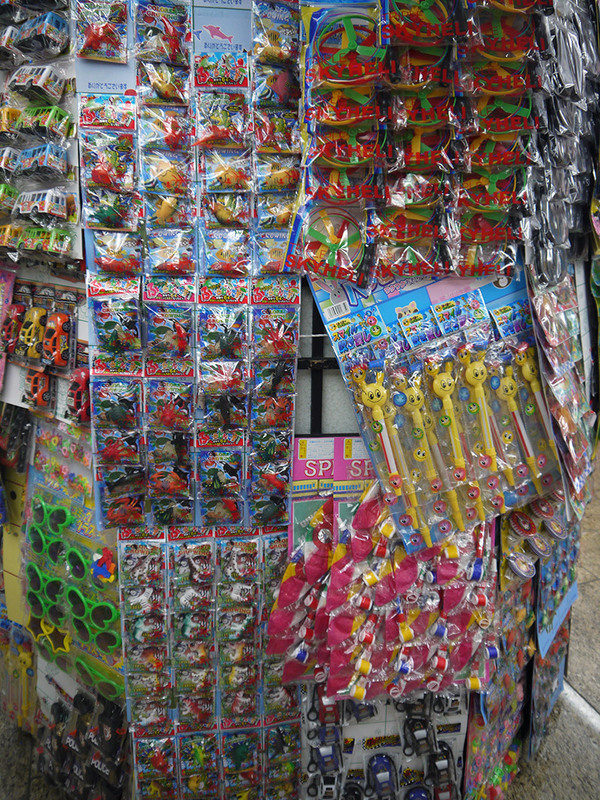 If you're strolling through Tokyo, you may randomly run into a makeshift store filled with toys, candy, and games. If you have the time, take a few minutes to walk around. When I was in Japan last, one such place was just outside the west exit of Shinjuku station, a little place called Kashiya 菓子屋（） Yokochou 横丁（） Edoya 江戸屋（）, or "Sweet Street Edoya". 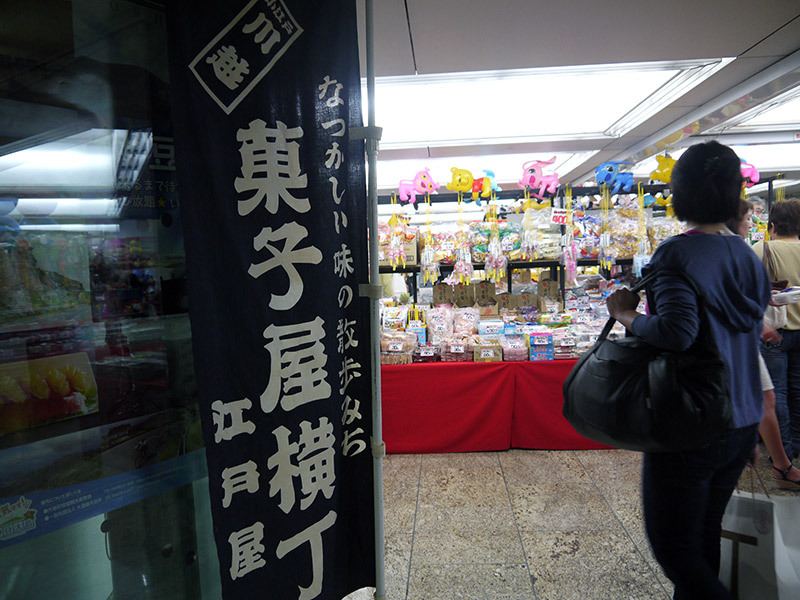 This alleyway of pop-up shops offers the best in なつかしい toys and candies. Whether you're a child or child at heart, this colorful place is worth a look. 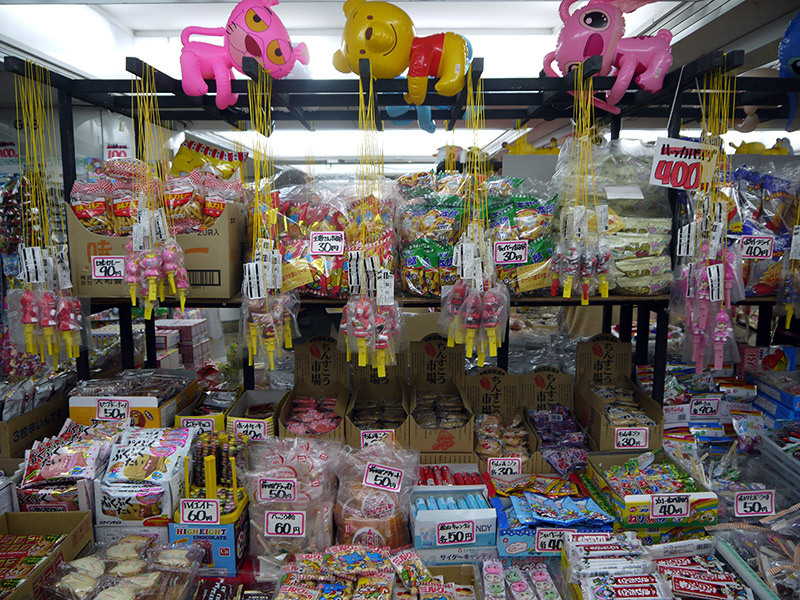 Welcome to one of Tokyo's Pop-Up Toy and Candy Shops. Hope you're ready to enter a world filled with childlike wonder. Cuz that's where you're headed. Here at Edoya, you can buy candy by weight. It's like the bulk candy store at the mall, but on tables. TABLES! That makes it better. 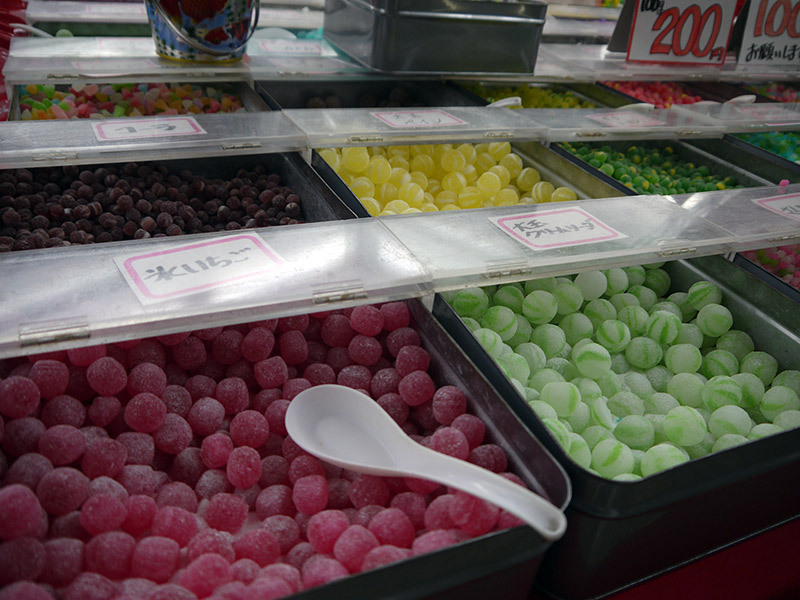 There are so many colorful jewel-like candies here. They are so cute, aren't they? I wonder if a candy pirate is supplying this store with his candy treasure. Arrrrr! Candy isn't the only thing you can buy by weight. 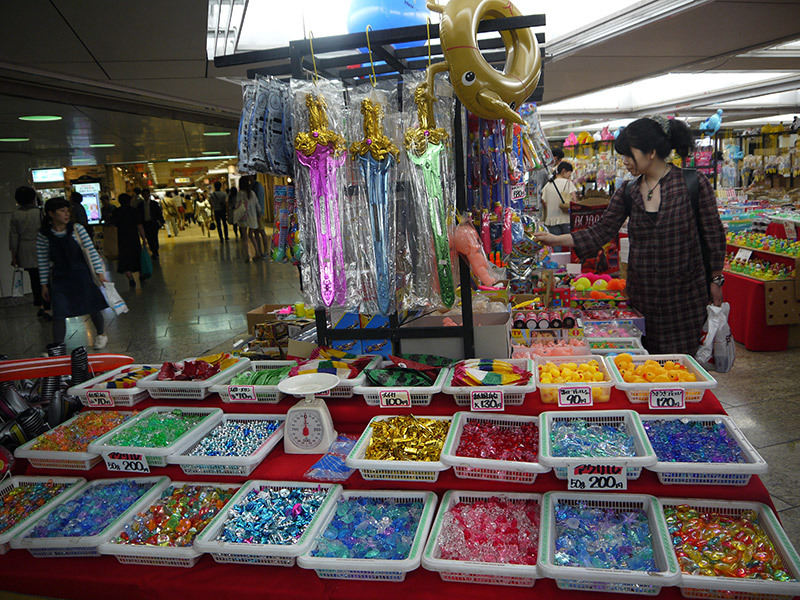 You can also get some shiny marbles and other small toys. It's a great way to get a kid a lot of stuff for not a lot of yen. Here are some items that are often seen at Japanese matsuri (festivals). 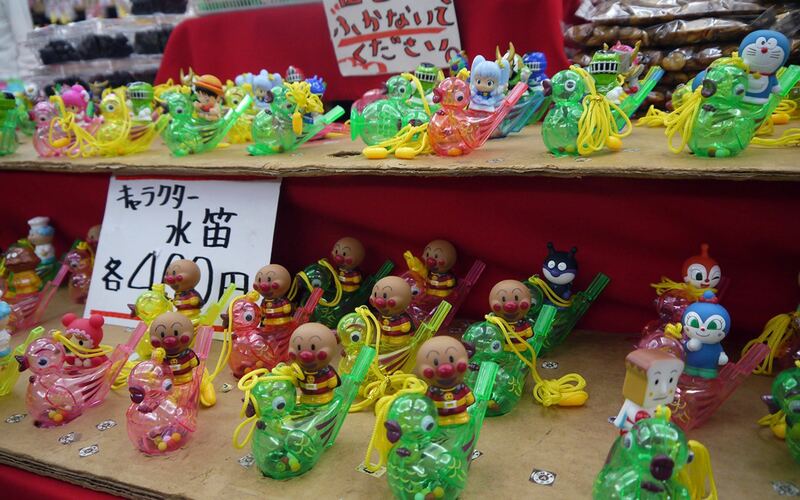 For example, some Anpanman whistles that work under water. It makes me want to put on my yukata and eat yakisoba! 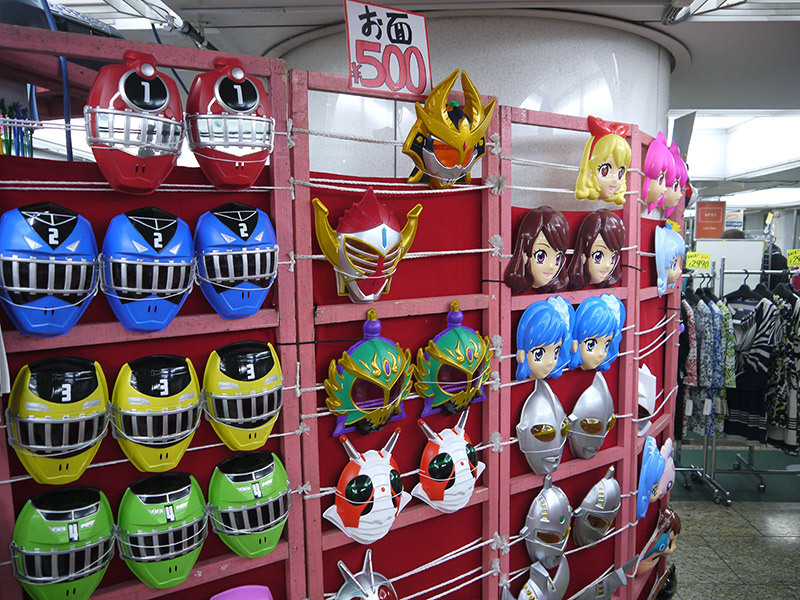 Another staple of matsuri, Japanese character masks. You can masquerade as your favorite cartoon character, or wear it on the back of your head to scare people walking behind you. 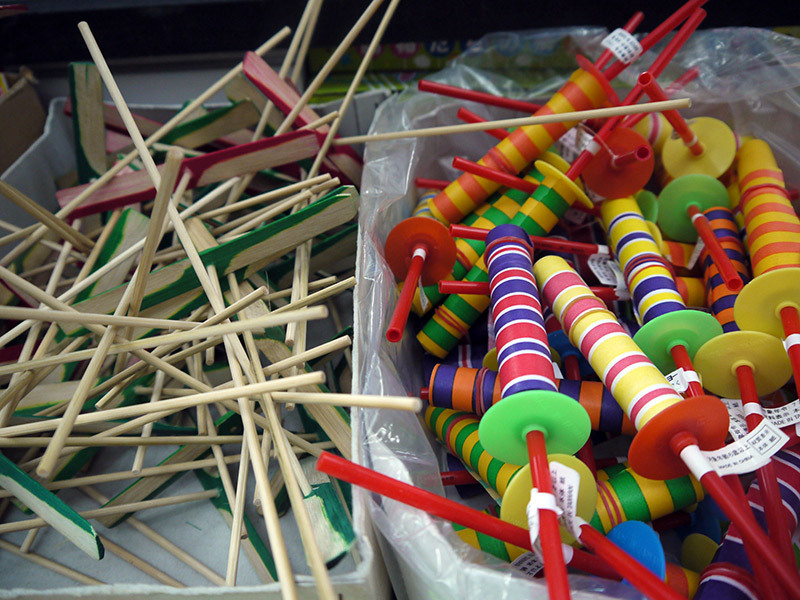 Edoya also sells traditional Japanese toys such as koma, also known to many as spinning tops. You can battle them or just watch them spin, spin, spin. 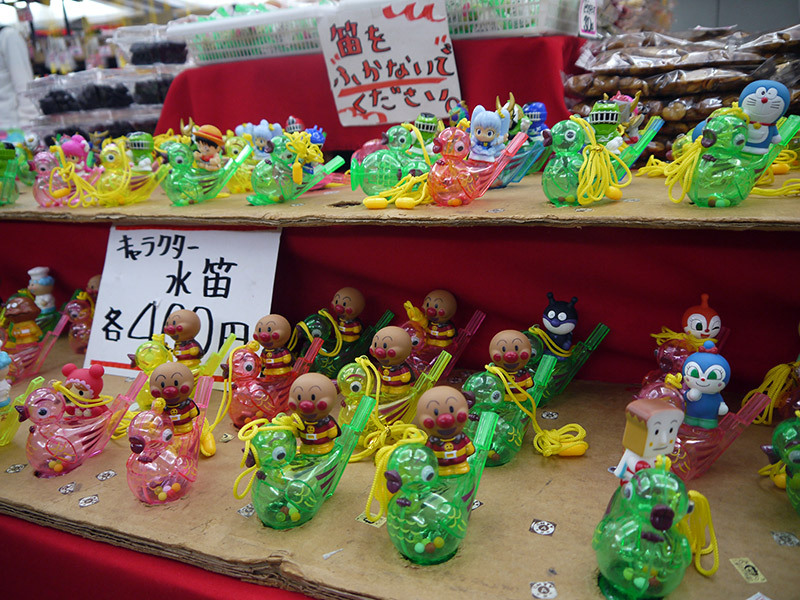 Taketonbo (a.k.a bamboo-copter) is a small wooden toy that flies when spun between the palms of your hands. 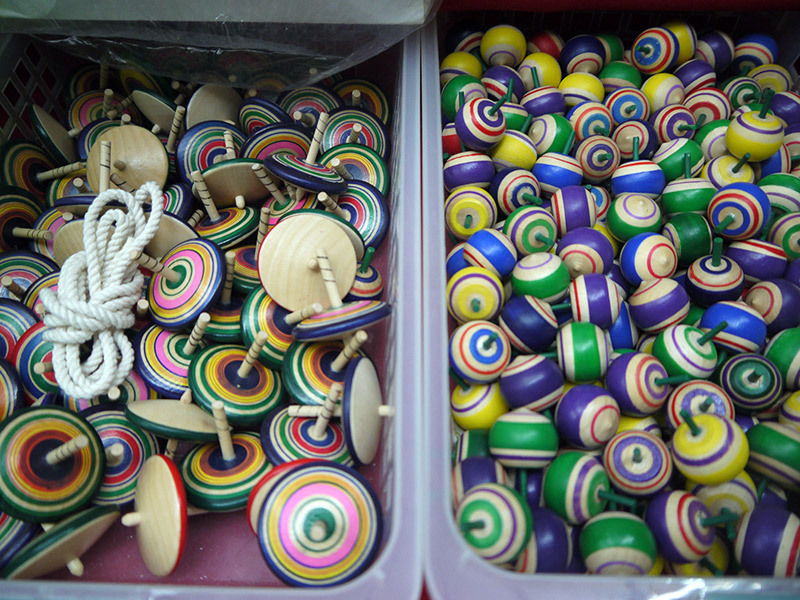 The toys on the right of this picture are called paper yoyos. 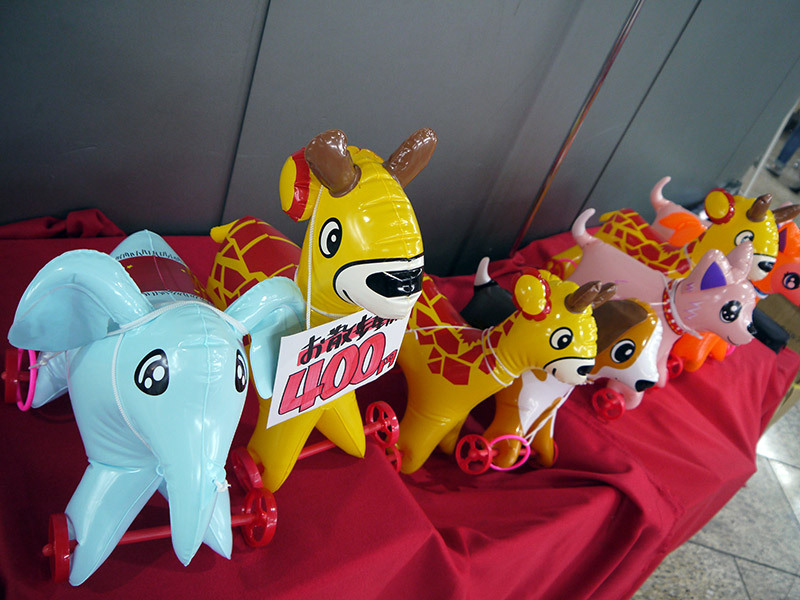 You should recognize these toys. 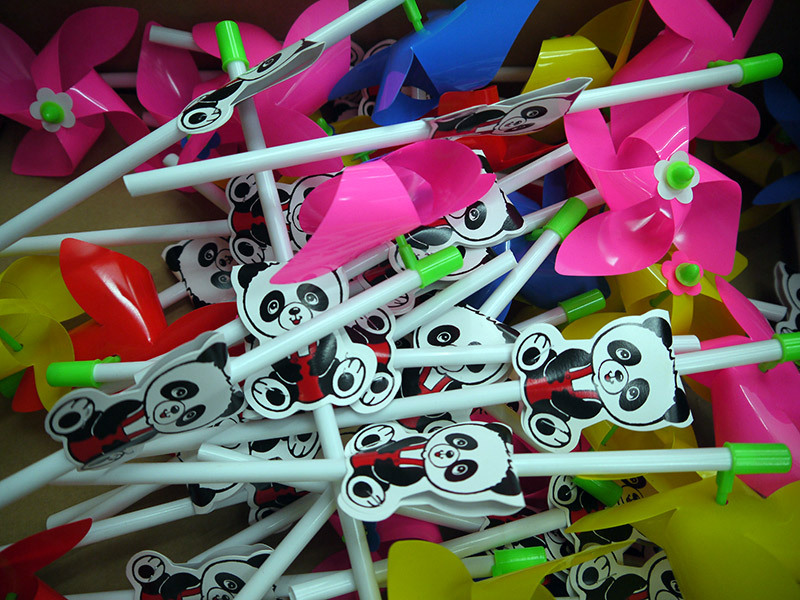 They're kazaguruma, also called pinwheels. There are cheap traditional kids snacks too. These flavors can take you back to the Showa era, or perhaps beyond. 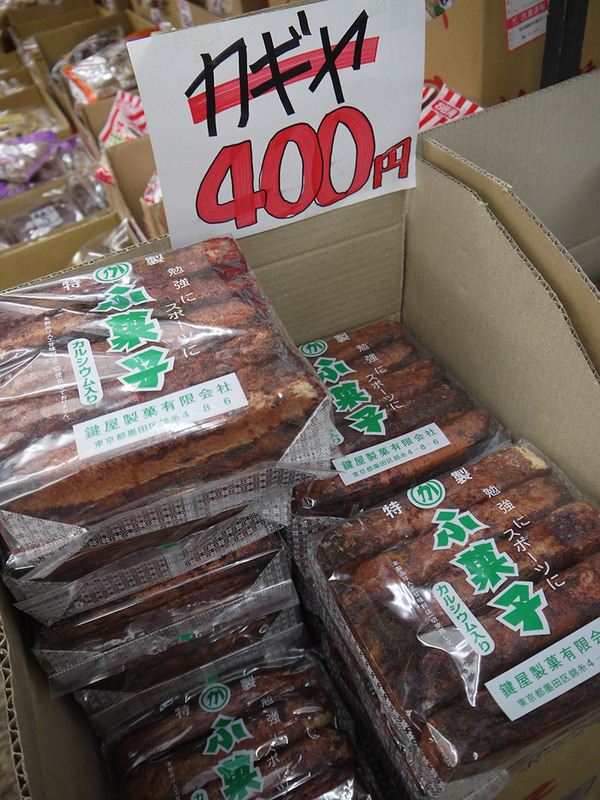 These brown sticks are called Fugashi, which is a dried wheat gluten snack. The package says it's good for studying and for sports, but I don't know how true that is. Any of you readers who need help with sports and/or homework should give it a try and let me know the results. Looking for great omiyage? Look know further than this half cylinder. 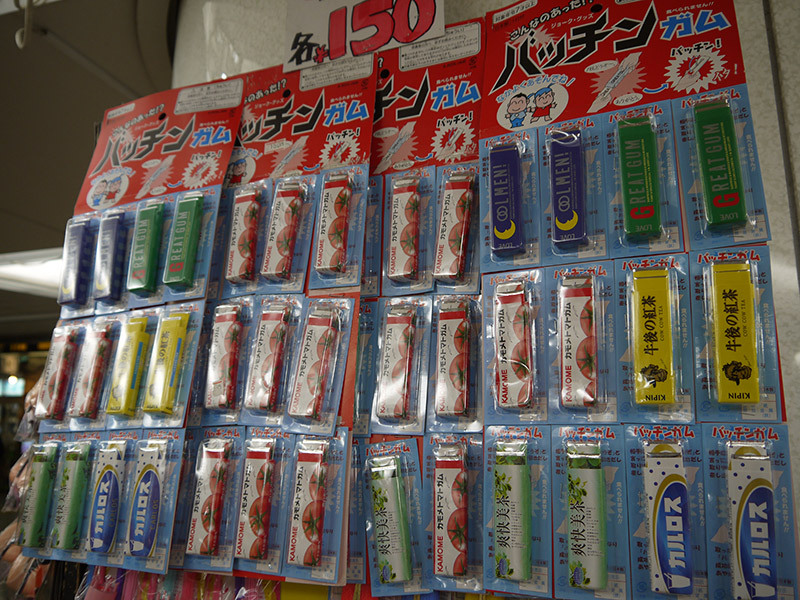 These candies are called "bacchin gum," or trick gum. You can use it to prank your friends, family, and enemies. Pretty much anyone you love/hate. It's strange that they made a tomato flavored trick gum. That's too weird even for trick gum. Too far, tomato gum. Too far. Here is my favorite prank item, a pair of Groucho glasses. 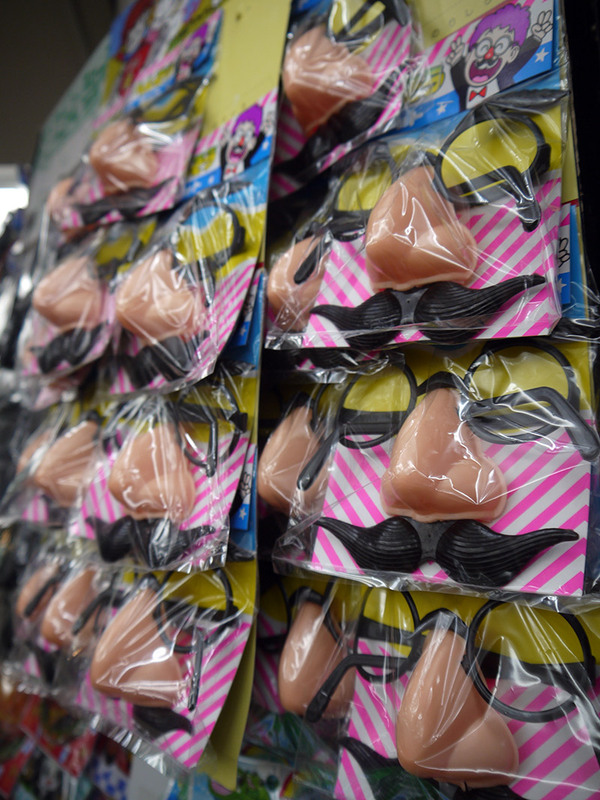 Put them on and make people think you're a dead comedian! For your kid who keeps begging you for a pet, here is a toy that they can take for a stroll. Make them promise to walk, feed, and protect the toy for seven years. If they do that, you'll get them a real pet. The Sweet Street Edoya is a special, temporary shop that was open in Shinjuku station, but their actual shop is in Saitama (check out the address below). 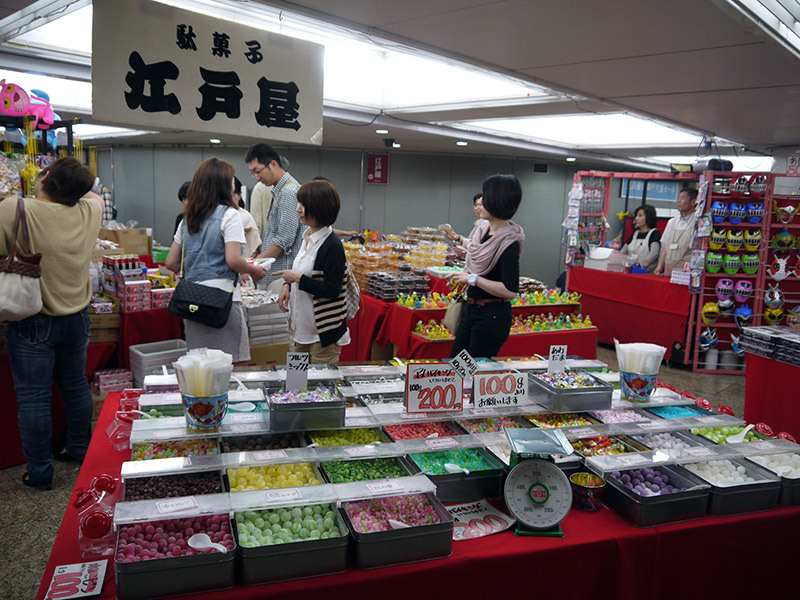 The Edoya company opens these temporary pop-up shops throughout Tokyo frequently. There is more inventory in their Saitama shop, but temp shops like the one in Shinjuku have more than 500 items, so you won't be hurting for toys and candy if you visit. Whether you deliberately go to their Saitama location or stumble open one of the temp Tokyo shops, you'll be glad you did. I like retro toys and candies, but I couldn’t enjoy it as much as I did when I was a kid. They had a nice selection, and I felt a nostalgia though.